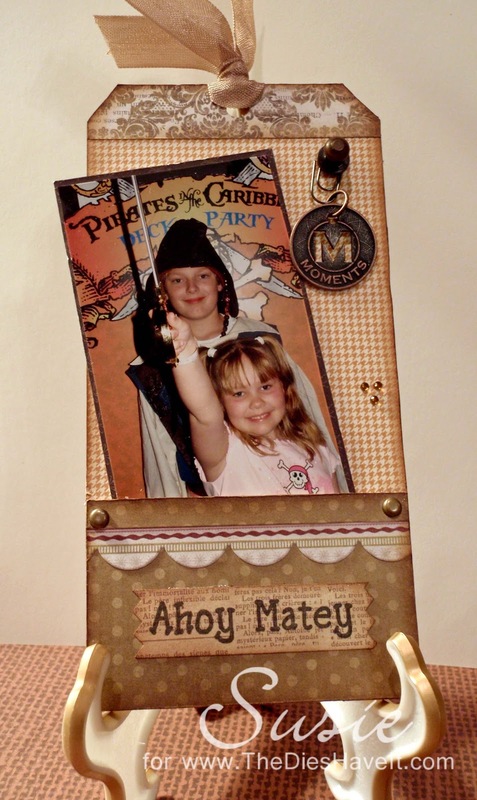 Created 4 Creativity : Ahoy Matey! If it's Wednesday, it must be time for another Joy's Life Design Team Challenge. This week our theme was FAMILY TIME. Usually you would see one of my grandkids here, but instead I am focusing on a family that I also consider MY family. I have watched these two little pirates grow up over the years and I have many pictures of them. This one was taken on a Disney cruise a few years ago. Aren't they the cutest pirates ever? I was in tag making mode when I fashioned this little gem for their mom. I used papers from the Lost and Found collection, a few little Tim Holtz doo-dads and the Medium Simply Scallops Border die from MFT Stamps to make my project. But the star of the show is my AHOY MATEY sentiment from Joy's Life Stamps. I just love the font. Now hurry on over to the Joy's Life Design Team Blog to see what the other gals have to inspire you. And tomorrow I will be back with my first December Cardabilities sketch.